​This is the end of the toughest, longest but best journey of my life. 3000km. 133 days. 3 pairs of shoes. At least 100l of mud. Uncountable awesome moments, stunning views, amazing people (including my incredible blog readers). I am proud, happy and sad. A big chapter is over. But: Every ending is the start of something new! 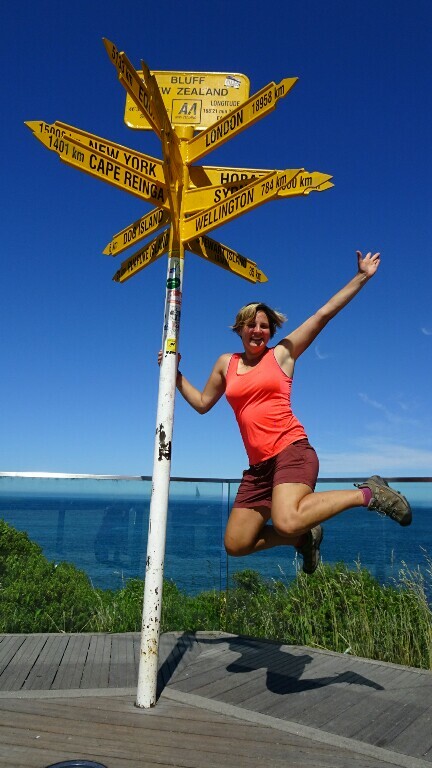 Previous Post Colac Bay to Invercargill. Beach again! 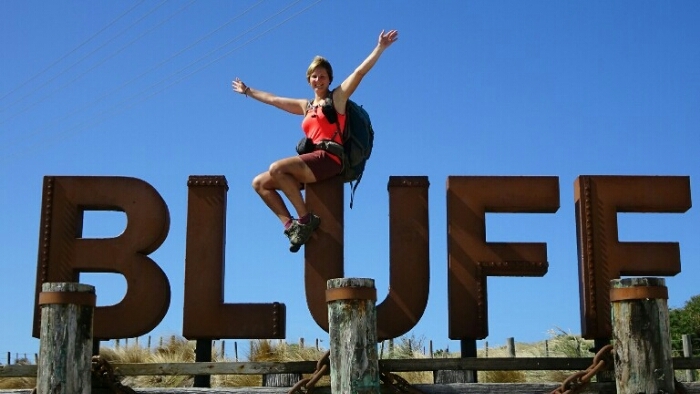 Next Post Invercargill to Bluff. This is the end. What a disaster : it’s over … Hats off ! Indeed a disaster 😉 Now I actually have to work out where to go next every day and can’t just follow a trail for months! Merci for all your comments and encouragements!!! Congrats! 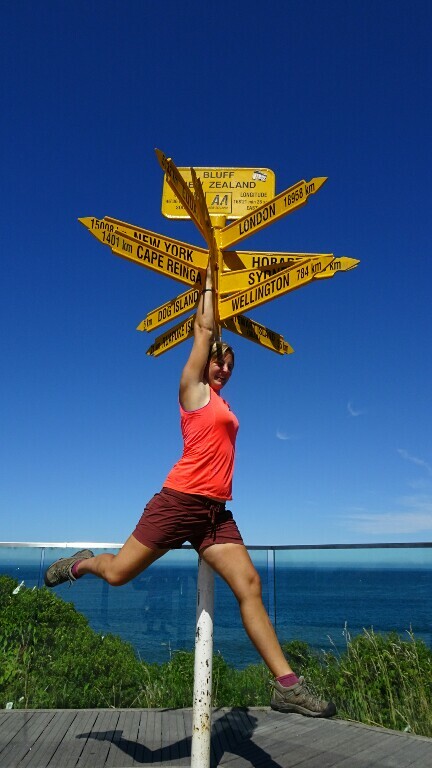 Aeesome achievement, Especially after those hatd parts around Arthur’s Pass. You will never forget this experience of being on the trail for such a long time. Congratulations Bettina. Many of us have followed your journey, including myself via your blog or Instagram. You have been an inspiration. Plus you have provided some amazing observations, filled us with moments of beauty, made us gasp in trepidation and hold our breath in fear with your tales of the trails testing of your resolve. May you journey on with more confidence than you started with this one. May the future be filled with wonder for you. I turn 70 this year and in November I shall commence the journey down the same trail in celebration of that event. Congratulations – for an awesome job. Thanks for sharing. Thank you very much! It was so much fun to hear from Jellybean and Carbo about you. They must be finished as well now!? Well done. We were a few days after you on the QC trail but then came back to Aust. I have followed you and other blogs on the TA trek and you have exceeded by far all others in content, data and great pics. In fact, after following you each few days, I am encouraged now to do the TA because of you. You and Peggy were a great inspiration for us ‘downunder’. Congratulations. Hi Peter, wow, thank you! I guess the most important thing is to stay determined (useful that I am stubborn! )… It’s tough but worth it, so go and do the TA if you can! All the best for you. 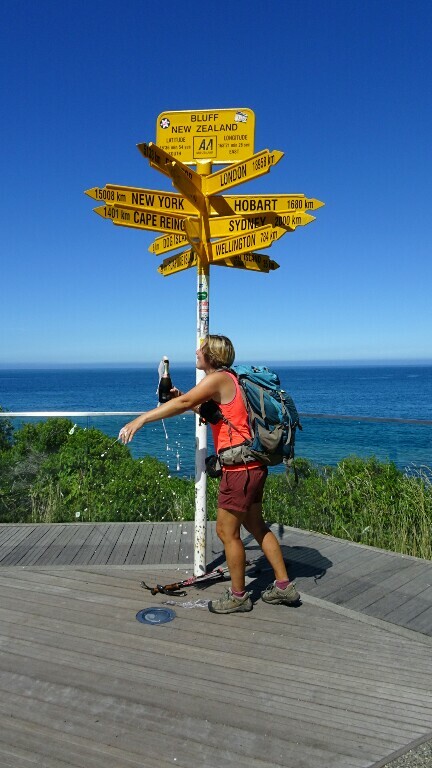 All the best for your own adventure and Bluff signpost swinging! BETTINAAAAA !!!!! Du bist der Oberhammer, feier bitte doppelt so viel einfach nur DICH :-* hoffentlich bis bald. Daaaankeschön 🙂 War dann gestern abend doch zu müde zum feiern, aber das wird nachgeholt! I never intervene on your blog, but it was with joy and assiduity that I followed your adventures. What a joy to see your perseverance en your enthusiasm. I will leave in October 2017 for I hope live the same experience, adventures as you. In this regard, as I also plan to hold a blog, can you tell me how much it cost you in GSM package. Was it easy to ave network for send your reports. Hi Eric, thank you very much! I hope you still want to do the trail after reading my blog 😉 All the best for your adventure and stay determined! If you use a simple WordPress blog you don’t have to pay anything. I pay a small fee for my domain hello-mountains.com every year, but you don’t need to buy one. The WordPress app works alright. What worked best for me was writing every evening my blog in my tent in a “notepad” app, selecting and already downsizing images (to around 250kb, otherwise uploading takes too long). Once in town I copy pasted the text in the WordPress app and added pictures. Wi-Fi didn’t work well in every hostel but luckily I had the Spark mobile contract and could use some phone cabins as well for Wi-Fi (not everywhere though). Public libraries also have free and mainly good Wi-Fi. Let me know your blog name, I would love to follow you! It is with pleasure that I will send you the contact details of my blog. I will test it during my trek in the Lake District in northern England. If I can still afford. I intend to do the Araroa in the same spirit as you with a maximum of nights in tent and do not throw money out of the windows, but do you have an idea of what you paid for the 133 days (backpakers, camping, transport and food). Hi Eric, I spent much more money than planned initially… But I still need to work out how much exactly. Will let you know once I am done (not sure I really want to know ;-))…. If I never intervene on your blog, it was with joy and assiduity that I followed your adventures. What joy to see your perseverance, your enthusiasm. I will leave in October 2017 for I hope the same experience and adventures as you. In this regard, I also plan to hold a blog, can you tell me how much it cost you in GSM package. Was it easy to ave network for send your reports. Congratulations! It has been very inspiring to follow your journey. Hope to achieve something like that for myself too! Congratulations on completing your epic adventure! I was 3 months in NZ and met many of your fellow TA trampers (your 4 Canadians, Jellybean, and Carbo to name a few) but sadly we never met. We chose a wet (at least in the south island) year to go. I enjoyed reading of your travels and wish you many safe and happy miles. Hi Carlos, a pity we didn’t meet! Thank you for your wishes. All the best for you as well, hope you enjoyed the TA!